LIVING ROOM FIREPLACE SURROUND This living room fireplace surround was inspired from woodwork remaining amongst ruins of a church (circa 1860’s) located in Hunterdon County. 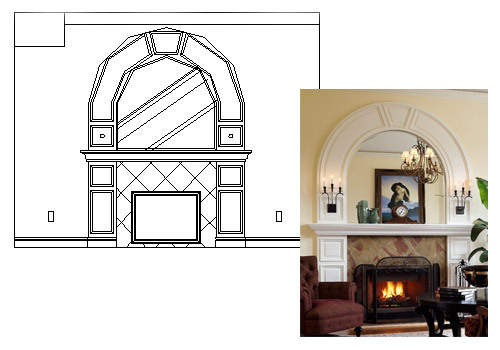 The design worked impeccably in complimenting the space, which already featured three Palladian windows in a similar size and shape to the fireplace surround. The finished look included a tiled marble surround, custom beveled mirror and decorative wrought iron sconces mounted in the woodwork above the mantle.